Today was my day off and it was kinda blustery outside. What do I do on a lazy day when I don’t wanna leave the house? I make pancakes for lunch. 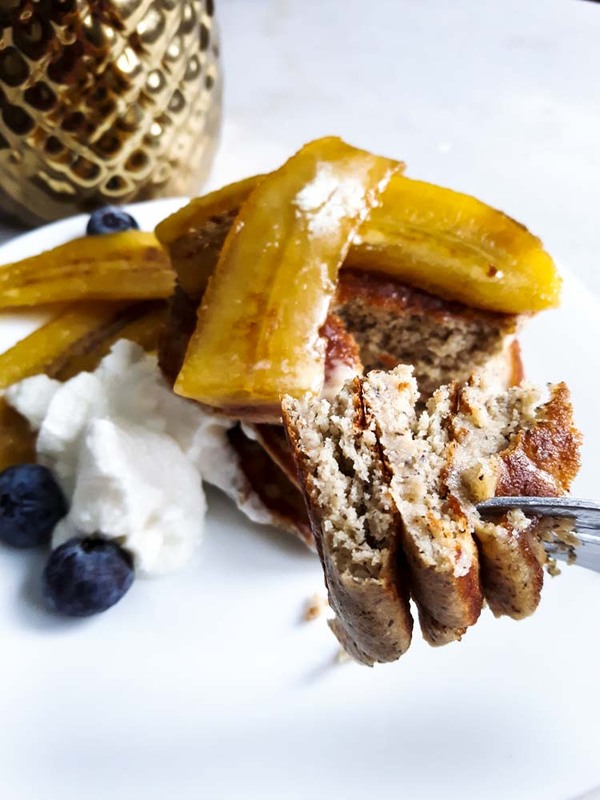 Gluten free buckwheat pancakes with caramelized bananas, to be exact! Does anybody else have a vast collection of random gluten free flours they never use even though they paid good money for them? Yeah, I’m trying to get better at that. Thus, these gluten free buckwheat pancakes were born. 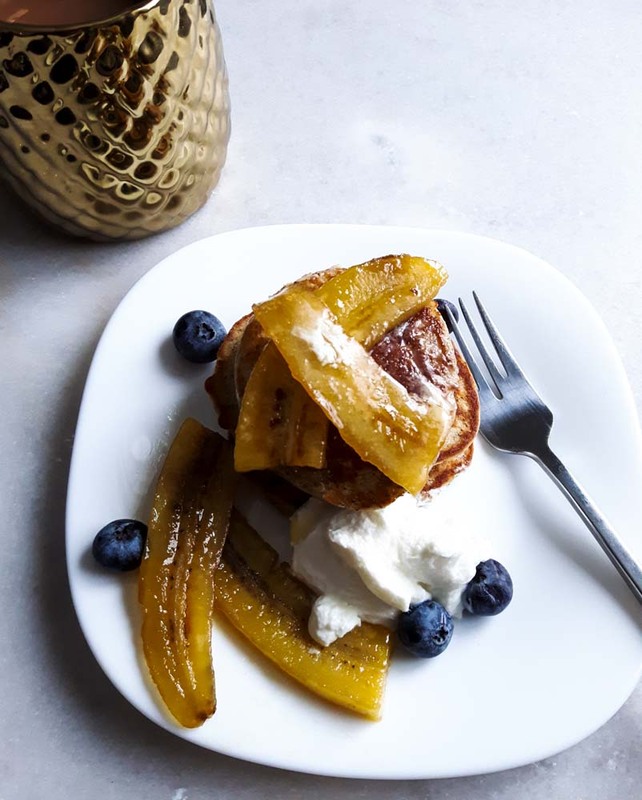 I didn’t have much fresh fruit in the house though, so I improvised with these caramelized bananas (one of my favs). It actually worked out really well with the starchy green bananas in the grocery store this time of year because they fried up so nice. Yeah, they were good. Darn good. Gluten-free baking is a bit of a challenge sometimes. Usually, what I cook tastes good immediately. With this? Nope. At first I made a trial recipe with just buckwheat and quinoa flour, and it tasted a bit grass-like. Not so good. I realized they were both somewhat grassy in flavour and needed to be rounded out with flavours that were…some what less healthy. So I scrapped the first batch, added some coconut flour (nutty) and greek yogurt (tangy) to the mix, and voila! Perfecto! I fried them in butter and topped with the bananas, and extra yogurt on the side. Try em out and let us know what you think in the comments! These use a mix of coconut, quinoa, and buckwheat flours for a high-fibre, hearty & fluffy pancake. Combine all the dry ingredients in a mixing bowl and mix until well-combined. In a separate bowl, combine the wet ingredients and mix with a fork or whisk until combined. Add the dry ingredients to the wet and stir until a thick batter forms. Thin the batter with additional milk if required, as coconut flour can be very absorbant. Melt the butter in a frying pan over medium-low heat. Add the batter to the pan in 2 -3 tbsp dollops and fry for several minutes until bubbles rise through the batter and the pancake has risen slightly. Flip and fry for an additional few minutes, until browned. Add the butter and oil to a frying pan and melt over medium heat. Add the bananas and maple syrup and fry for several minutes on one side until slightly browned and translucent. Flip and fry on the other side as well. 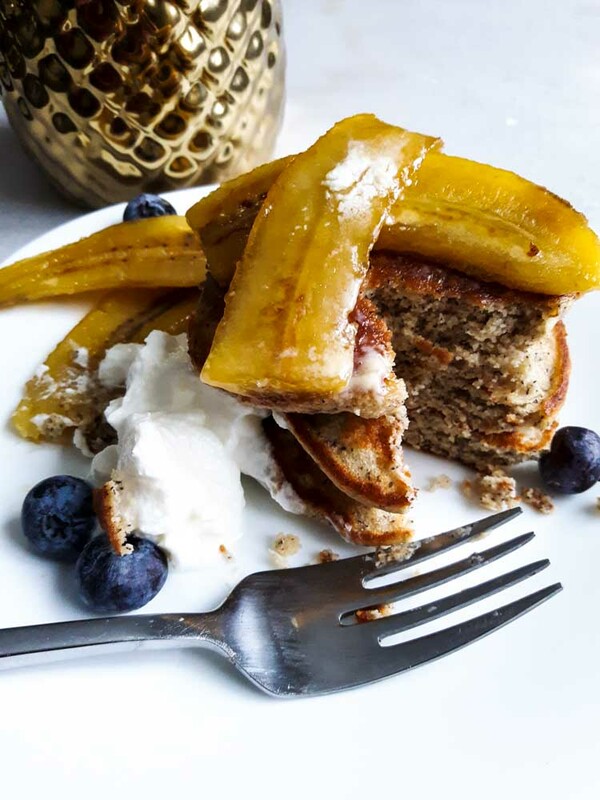 Top the pancakes with caramelized bananas and serve with additional yogurt and maple syrup.